Actually, it is recommended to use superlatives only with caution. 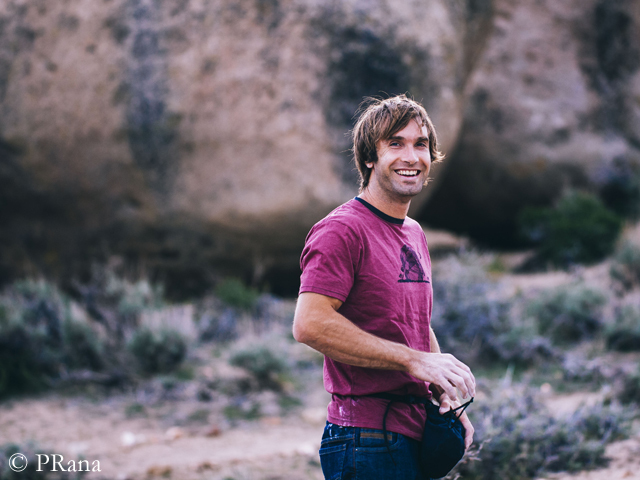 But it’s undisputed that Chris Sharma has been one of the best rock climbers in the world for many years. The 35-year-old American and the 24-year-old Czech Adam Ondra have so far been the only climbers who have mastered a 9b+ route (on the French grading system) – partly extremely overhanging, actually impossible to climb. Currently the measure of all things. Chris is living with his wife Jimena Alarcon and the little daughter Alana in Barcelona. Chris, you have been climbing at the highest level for so many years.. Do you think that you one day get tired of doing it? Such big garbage bags have guaranteed not yet been brought down from Mount Everest. The Expedition Operator’s Association Nepal (EOA) has delivered canvas bags, capable of holding 80 kilograms, to Everest Base Camp. 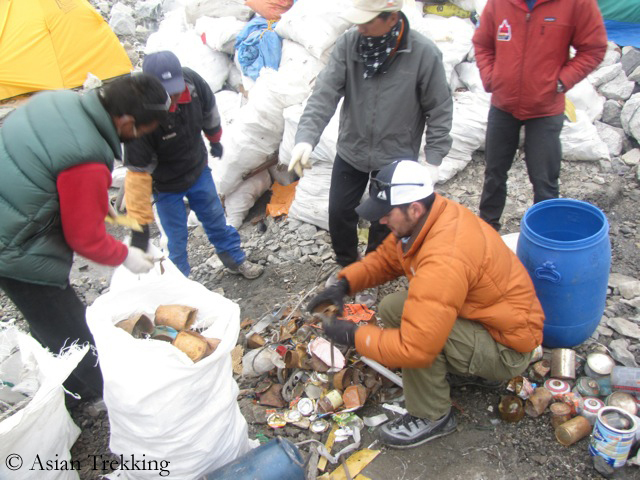 They are to be used in particular for transporting old tents and garbage, which have accumulated in Camp 2 at 6,400 meters due to the premature end of the climbing seasons in 2014 and 2015, down to the valley. 80-kg bags are, of course, too heavy to be shouldered by porters and carried through the Khumbu Icefall to Everest Base Camp. Never say Never Again! This is not only the title of an old James Bond film but could also stand for Ralf Dujmovits’ personal story on Mount Everest. 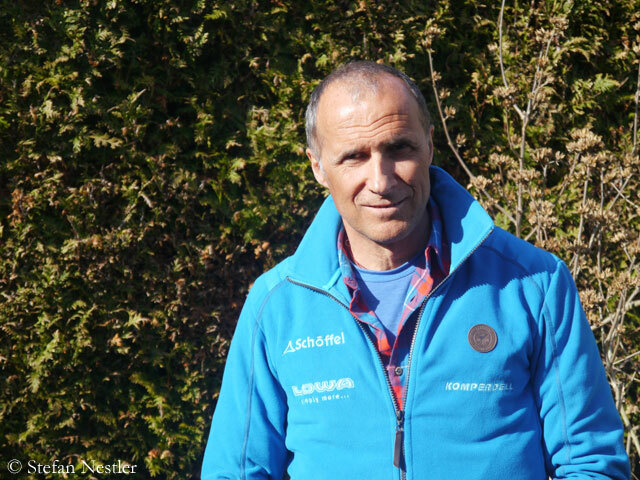 The first and so far only German, who has scaled all 14 eight-thousanders, had climbed the highest mountain on earth on his very first attempt in fall 1992. Due to bad weather, however, he had used bottled oxygen above the South Col. “I was very young at the time. It was a mistake,” says Ralf today. 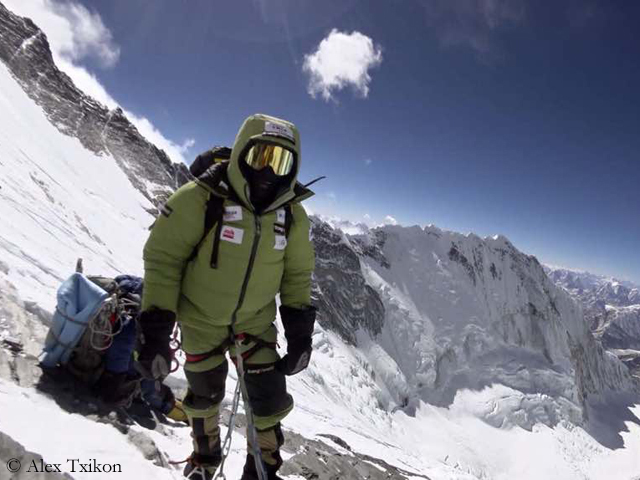 After all, he climbed the other 13 eight-thousanders without breathing mask. And so he later tried to wipe out this Everest mistake again and again. In vain. In 1996, 2005, 2010, 2012, 2014 and 2015 he returned without summit success, for various reasons. This spring, the 55-year-old wants to give it a try again. 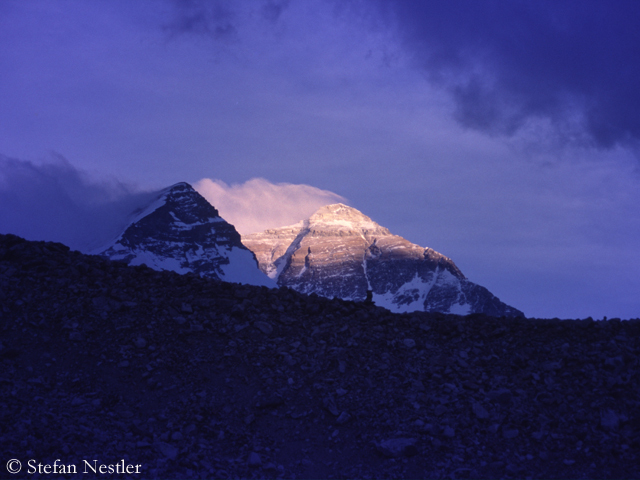 For the eighth time, he will travel to Mount Everest, the fifth time to the Tibetan north side of the mountain. 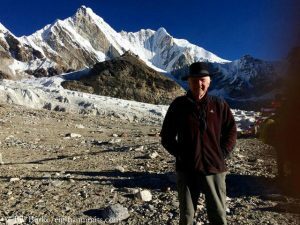 He will acclimatize in Nepal with an ascent of the 6,501-meter-high Cholatse in the Khumbu area, along with his Canadian partner Nancy Hansen. Ralf has now arrived in Kathmandu. I spoke with him shortly before he left to Nepal. Ralf, I think, it’s allowed to say, that you and Everest have a relationship. Tailwind. There was a lot of it for our “School up!” project yesterday. The Rhineland-Cologne section of the German Alpine Club (DAV) had invited to a charity event to support the reconstruction of the school in Thulosirubari which had been destroyed by the earthquake in Nepal in 2015. The hall in Cologne was sold out. 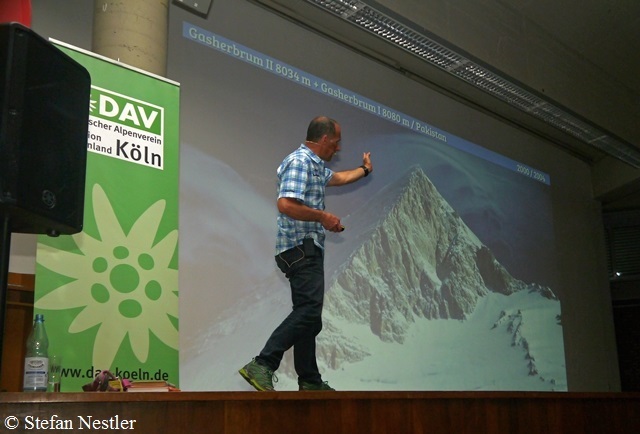 About 400 mountain lovers had come to be taken away by Ralf Dujmovits to the highest mountains in the world. 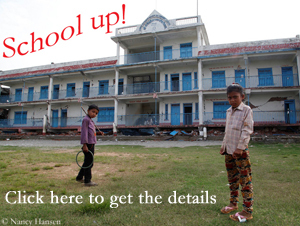 At the end of June 2015, I had launched, along with Ralf and the Austrian top climber Gerlinde Kaltenbrunner, “School up!” to rebuild the “Gerlinde and Ralf School” as soon as possible. 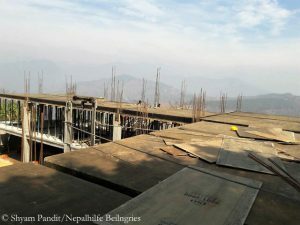 All proceeds of the evening in Cologne flowed into the current construction work in the small village, about 70 kilometers east of Kathmandu. As reported, Steck had completed an intensive training camp with the German David Goettler and the Italian Hervé Barmasse in the Khumbu area in February. Subsequently, Ueli returned to Switzerland for a few weeks. He will set off to Kathmandu on 8 April. Ueli, during the training Camp in Nepal in February you ran and climbed a total of about 250 kilometers with 15,000 meters in elevation. How much has been added since then? 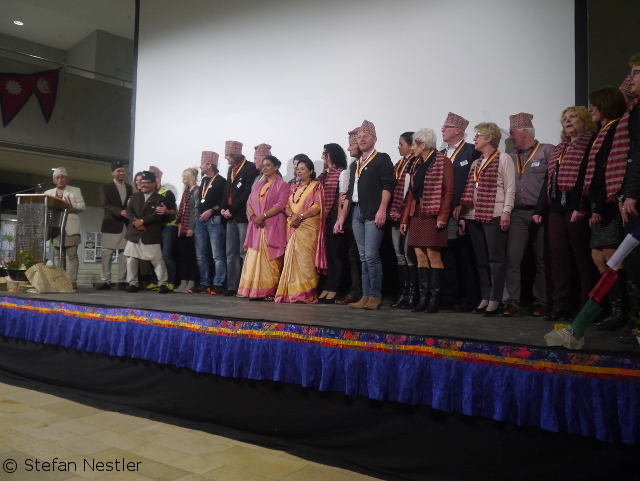 An aid organization like a family – the Nepalhilfe Beilngries celebrated its 25th birthday yesterday evening with a festive event in the small Bavarian town. “I am proud that I have been part of the Nepalhilfe family since it was founded,” said Sunil Shrestha in his speech, bravely delivered in German. The 57-year-old has been coordinating the aid projects of the organization in the Himalayan state for a quarter of a century. Sunil and Shyam Pandit, also an important liaison man, had traveled, along with their wifes, from Kathmandu to Beilngries to celebrate with their German and Austrian friends. 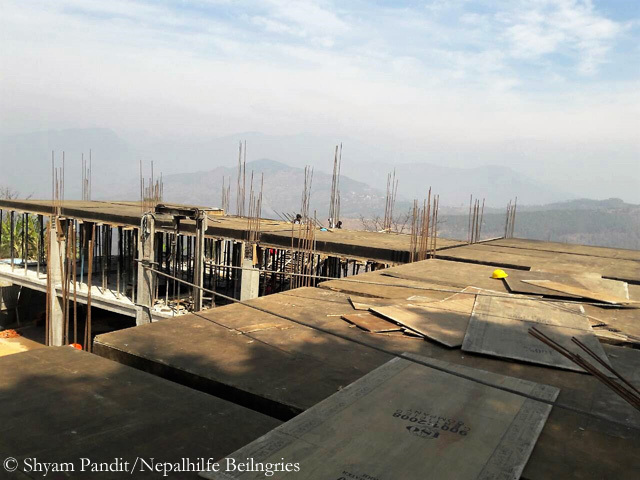 “The family should be proud of what we have achieved,” Shrestha said. 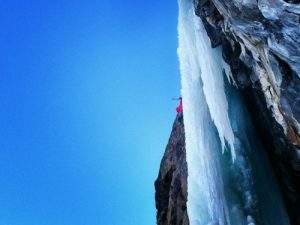 Ice climbing is fascinating, but also dangerous. Two weeks ago, the Austrian extreme climber Thomas Bubendorfer survived with plenty of luck a ten-meter-fall from an icy waterfall in the Dolomites. The 54-year-old had landed in a creek bed and had suffered serious injuries. For a week, Bubendorfer was held in an artificial coma. Earlier this week, he was transferred to the Salzburg University Hospital. He is out of danger, addressable and does not have to be given artificial respiration anymore, said a hospital spokesperson. Even before Thomas’ accident, I had talked to Matthias Scherer. 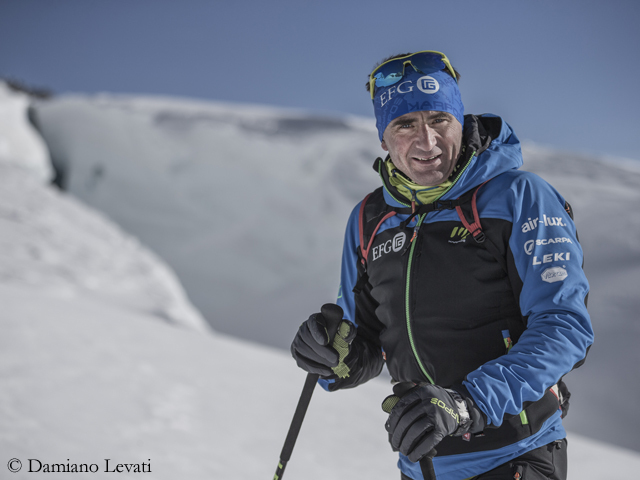 The 42-year-old is a professional ice climber; since 1993 he has climbed more than 500 frozen waterfalls in Europe and Canada. 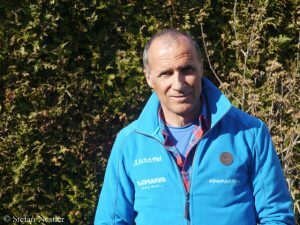 Born in Frankfurt, he has been living and climbing along with his wife Tanja Schmitt in Cogne in the Aosta Valley, on the south side of Mont Blanc. Matthias, is there something like a network between ice climbers, over which you communicate where the best ice conditions prevail? 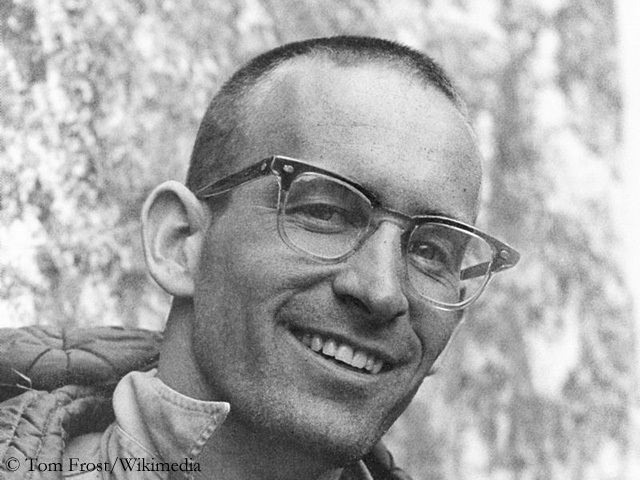 One of the great pioneers in rock climbing has gone: Royal Robbins died yesterday in Modesto, California after a long illness at the age of 82 years. “My father faced challenges in his climbing, his writing, his business, his role as a father and husband, and later in life in his debilitating illness,” said his daughter Tamara Robbins. “Through it all, he rose to the occasion, taking the challenges on with grace and humility. For that, he’s my hero.” In the late 1950s and 1960s, Robbins had set standards in bigwall climbing. 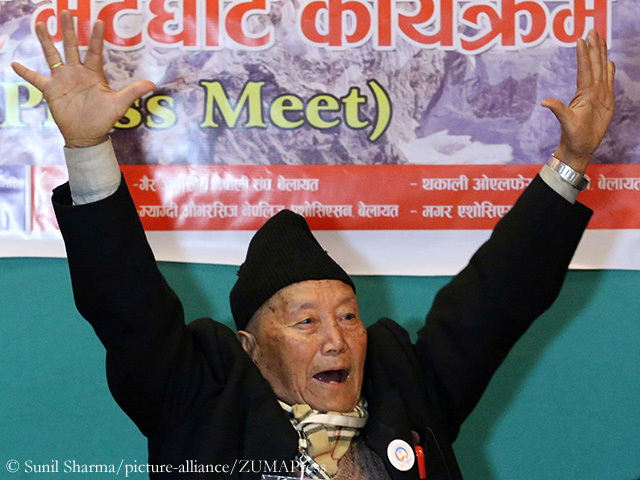 Why does a 85-year-old need to climb Mount Everest? For world peace. For environmental protection. For the self-confidence of old people. As an inspiration for the young. All these alleged reasons had to serve when, earlier this week, Min Bahadur Sherchan officially announced in Kathmandu that he would try to reach the 8850-meter-summit this spring. The real and only issue is to regain the Everest age record from Yuichiro Miura. In 2013, the Japanese, then aged 80, had replaced Sherchan as “Everest Methuselah”. For five years, the Nepalese had previously led the record list after standing on the highest mountain on earth at the age of 76 years and 340 days. Alex Txikon throws in the towel. His second summit attempt failed too – and so did the entire winter expedition. 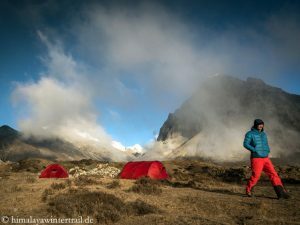 The 35-year-old Basque and his Sherpa team decided in Camp 2 at 6,400 meters not to ascent further up. Instead, they packed up and returned to Everest Base Camp today. “It really would have been suicide to go on,” Txikon told his team by satellite phone. “As the head of the expedition, I should not endanger the lives of my companions. And not my own.” Nevertheless, the decision to abandon the summit attempt was not easy, Alex admitted. It is a race against time. Another storm front is approaching Mount Everest. The meteorologists expect the small weather window with relatively favorable conditions in the summit region to remain open only until Wednesday and then close for a longer period of time. Therefore Alex Txikon, who wants to climb Everest in winter without bottled oxygen, has to push now. In two weeks, the meteorological winter will end. On Monday, the 35-year-old Basque and his five-man strong Sherpa team climbed up to Camp 2 at 6,400 meters. Today Txikon and the Sherpas Nuri, Gesman, Temba, Sanu and Pasang Nurbu want to reach the South Col at 7,950 meters. All Sherpas use supplemental oxygen. 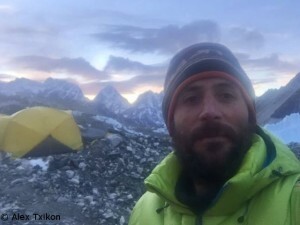 Three weeks ago, Txikon’s first summit attempt had failed on the South Col. “We hope to reach the summit on Wednesday ,” Alex said.